Joyce has three daughters, six grandchildren, and a chihuahua she rescued named “Buster Posey” after her grandson’s favorite baseball player. 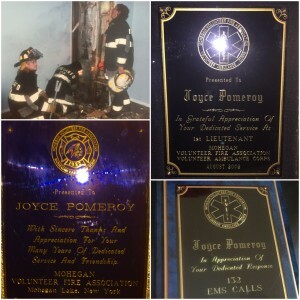 She is a retired 1st Lieutentant with the Fire Department and was honored with several awards and recognitions for her years of volunteer service as a Firefighter and EMT. Joyce also managed Hudson Valley Cardiology for 18 years. She was an EMT instructor for New York State and taught various vocational medical classes as well. 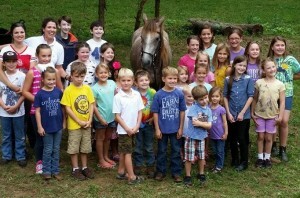 In 2006, Joyce founded Last Stop Horse Rescue (LSHR), a 501c3 non-profit organization, licensed in Maine and Georgia. LSHR is dedicated to saving abused and neglected horses of all breeds and backgrounds. Joyce studied Natural Horsemanship under Pat and Linda Parelli, and believes in their program through living proof of its success. She incorporates Parelli methods, along with her own, to rehabilitate each horse according to their personal individual needs. No two horses are alike, so LSHR does what is best for each horse while always maintaining a natural horsemanship, no-force, loving approach. Joyce has participated in several veterinarian training programs with the University of Maine and on-site clinics in Gainesville, Georgia. 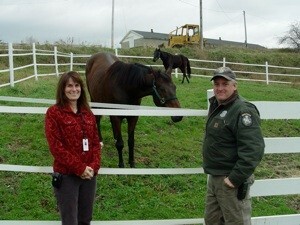 She has also hosted community events with Job Corps, Girl Scouts, and 4-H.
One of Joyce’s proudest moments in rescue was her involvement when the Bolduc Correctional Facility formed a relationship with the Division of Animal Welfare of the Maine Department of Agriculture, Conservation, and Forestry to establish their Shelter Me horse program for inmates. The program began in 2012 with 2 very special horses, Bradley and Lincoln. Lincoln was an ex-racehorse rescued by LSHR. These horses would serve as therapy for the inmates, giving them a sense of value and purpose. Joyce rehabilitated Lincoln so that he could rehabilitate people! Toni has a diverse background working with the public. After working 7 years in healthcare and EMS, Toni served her community as a fulltime Deputy Sheriff. Due to injury, Toni had to retire from law enforcement. She started writing and spending time with horses as a way to help cope with her inability to work as a Police Officer- something she was very proud of and wanted to do ever since she was a little girl. 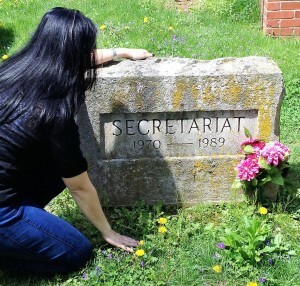 Toni’s love for horses began with the greatest racehorse to ever live… Secretariat! They also share the same birthday, March 30th. But what happens to equine athletes after they cross their final finish line? Toni has a passion for rescuing ex-race horses off the track and into her heart where she helps find them a new beginning. Many horses have come to Last Stop Horse Rescue full of anger and fear. Not only is Toni quickly able to gain their love and trust in a miraculous way, she is able to bring their stories to life for children using age-appropriate detail while still maintaining each lesson through her writing. Her first book, Believe in Miracles: Lessons from the animals at Last Stop Horse Rescue, was written to teach children heartwarming lessons of love, hope and friendship. It is a collaboration of true stories about how the animals found their way to LSHR, and was ranked #1 New Release in Children’s Books by Amazon! Toni then began a series entitled, TRUE STORIES FROM LAST STOP HORSE RESCUE. The series includes: Last Stop Horse Rescue Plays Cupid!, which was also ranked #1 New Release in Children’s Books by Amazon!, and Last Stop Horse Rescue Saves Benny!, a children’s adaptation of our “Benny Video” seen here: Benny’s Journey (LSHR was honored by the ASPCA as Rescue of the Year 2014 for Saving Benny). Toni is an active member of her community; she and her son, Kenny, serve together on their church’s Acolyte Ministry Team. 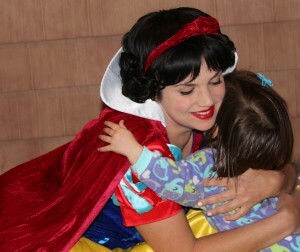 Toni also volunteers at children’s charitable events dressed as “Snow White”. She also enjoys watching her son play Travel Baseball (it’s like watching a 9 year old version of Buster Posey! ), Gold & Gem Prospecting with her daughter, Gardening, and spending quality time with her beloved Grandma Ginger. She has a buckskin horse named Pierogi, in memory of their Grandpa “Soulmate”. Dedicated volunteer, Peggy has four beautiful daughters and 6 grandchildren. She holds a Bachelor of Science degree in Marketing from the University of Rhode Island where she was born and raised. Peggy has always loved animals and is no stranger to horses, having 22, altogether, once! Peggy moved to Georgia in 2000, but something was missing…. she missed her New England relatives and was ecstatic to learn her cousin Joyce was expanding LSHR’s second location to her hometown here in Gainesville, Georgia! Peggy has over twenty years of experience working for accounting offices, insurance agencies, and fabric stores. She enjoys gardening, sewing, cake decorating, and making memories with her grandchildren: Cora, Colin, Olivia, Cecelia, Landon, and Maddison; and also her great-nephew and niece, Kenny and Kimberly. Believe in Miracles... Never Give Up Hope! Do you need help with a horse? After many years of experience rescuing horses, we have seen a lot and still learn something new each day. Reflecting back over the years we realize many of the horses LSHR took in probably didn’t need to be “rescued.” Some were surrendered for no reason other than a lack of understanding between horse and human. This was such an injustice to the horse and its human who obviously once loved the horse but was frustrated and lost hope. We quickly realized how unfair these type of intakes were to other horses in dire need of life-saving care. If we continued accepting healthy horses who were just simply misunderstood, there wouldn’t be enough time, space, help, or funding for horses in need of extensive care like Benny, Charlie, and Murdock just to name a few. LSHR wants to help horse owners to never lose hope again. Owner surrender cases can be easily avoidable! We are always available by phone, email, Skype and Facebook to help with questions, concerns, or behavorial issues. We also have many resources to point you in the right direction. And will gladly travel if time and distance permits. Last Stop Horse Rescue provides a “Road to Hope”, so please never give up hope on your horse!